I've been talking about this subject since 08 on the website (longer in personal life), but it really has been starting to hit the mainstream the past 18 months or so. Aside from Peter Thiel offering $100K for some of the brightest minds to not to go to college (more for publicity of the issue), we are starting to see media recognize what has been another bubble - that of college cost. Much like healthcare, higher education is heavily subsidized, which leads to very little price control as there is not a free market. 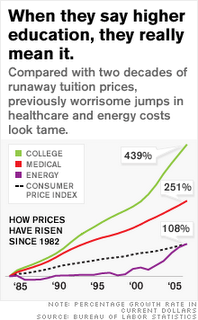 Healthcare gets all the attention because it affects everyone, but indeed university 'inflation' has far surpassed that of healthcare. This data is a few years old - suffice it to say, I am sure the green line and the red line have pushed even further apart since. If colleges could only charge what the free market would pay, I'd offer tuition would be substantially lower. How can I say that? If you put a price that only 25-30% of the people can afford out of pocket - you won't have demand. Economics 101. Empty classes don't work - so prices would need to be lowered until classes filled. The adjustment period from here to there would be difficult, with cries of "your freezing out those in the 'lower class' because they can't afford the costs" but that's actually 100% wrong. Give colleges 2-3 semesters of empty classes and suddenly a lot more people from every class will be able to afford college. Compare that to the current situation, where the only reason a great many of Americans are 'affording' the current price is through massive loan growth. This chart from The Atlantic is startling but puts it in context. It graphs the explosion of college debt versus all other debt - keep in mind the 2000s were a period of massive expansion of all forms of debt so the fact borrowing for education is so above trend during that sort of time frame in our history, is even more jaw dropping. Here's a chart based on New York Federal Reserve data for household debt. The red line shows the cumulative growth in student loans since 1999. 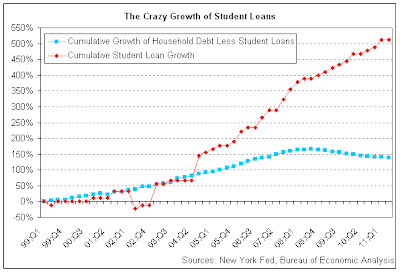 The blue line shows the growth of all other household debt except for student loans over the same period. Student loan debt has grown by 511% over this period. In the first quarter of 1999, just $90 billion in student loans were outstanding. As of the second quarter of 2011, that balance had ballooned to $550 billion. This also has real effects on the economy. 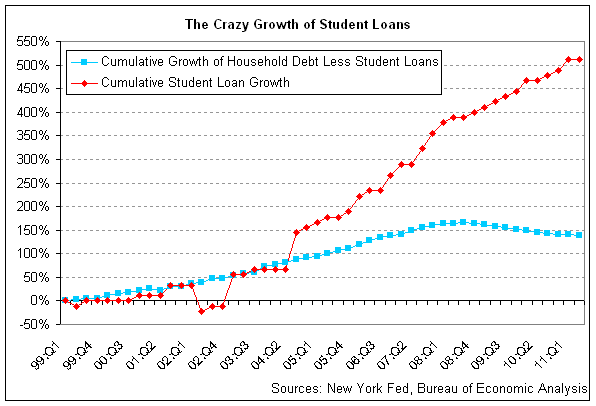 As newly minted graduates (or those who did not graduate but have the bevy of bills) struggle with huge debt loads that is less money they have for an eventual down payment, less money for consumerism (70% of the American economy), less household formation, and the like. Just another government (or Fed) sponsored bubble - we've got them in every direction in current society. How do colleges manage it? Kenyon has erected a $70 million sports palace featuring a 20-lane olympic pool. Stanford's professors now get paid sabbaticals every fourth year, handing them $115,000 for not teaching. Vanderbilt pays its president $2.4 million. Alumni gifts and endowment earnings help with the costs. But a major source is tuition payments, which at private schools are breaking the $40,000 barrier, more than many families earn. As this semester begins, college loans are nearing the $1 trillion mark, more than what all households owe on their credit cards. Fully two-thirds of our undergraduates have gone into debt, many from middle class families, who in the past paid for much of college from savings. The College Board likes to say that the average debt is "only" $27,650. What the Board doesn't say is that when personal circumstances go wrong, as can happen in a recession, interest, late payment penalties, and other charges can bring the tab up to $100,000. At Loyola University in Chicago, 77 percent enroll with loans, as do 85 percent in New Hampshire's Franklin Pierce. At historically black colleges, where endowments are low and students are often poor, it's usually 90 percent. Nor is soaring private tuition the only reason. At public Kentucky State University, with only $6,210 in charges, 76 percent sign up for loans; so do 85 percent at the University of North Dakota, where state residents pay $6,934. What these figures suggest that borrowing is as much to finance living away from home as for bursars' bills. Of course, borrowing looms large in American life: homes, cars, boats, even buying stocks on margin. But student loans are taken out by eighteen-year-old freshmen, not exactly the most experienced clientele, nor can this be assumed of all parents. Indeed, the lending industry's lobbyists ensured that teenagers can sign up on their own, even before they're able to order wine with dinner. And unlike cars and boats, college repayments can dunned for several decades. If you want to get a name as an economic seer, try this one. The next subprime crisis will come from defaults on student debts, starting with for-profit colleges and rising to the Ivy League. The parallels with housing are striking. In both, the written warnings aren't understood, especially on penalties and interest rates. And in both, it's assumed that what's being bought will rise in value, in one case the real estate, in the other the salaries which will accrue with a degree. One bubble has burst; the second is already losing air.